Heart failure is not a case of the heart not working but means the heart’s pumping at a slower rate. When the heart pumps slow it does not support the needs of the other organs. Heart failure is caused by many factors, such as heart attack, infection, alcohol or drug abuse. Conditions that overwork the heart like high blood pressure and diabetes can also lead to heart failure. Monitoring symptoms and medications are imperative in order to track CHF and reduce hospital readmissions. Weight gain and elevated blood pressure are signs that CHF could be worsening and should be reported immediately. Assisted’s groundbreaking Enhanced Home Health program can help monitor these and other changes in symptoms with a series of touch points including home visits and tuck-in calls that can help identify these and other potential red flags. DID YOU KNOW… that 60% of adults do not know their blood pressure or cholesterol numbers? CHF Patients should follow a healthy, low sodium diet to help manage fluid levels. Usually, a sodium intake limit set to 2000mg a day. Oftentimes CHF patients are unable to manage the daily tasks surrounding meal prep and can benefit from an Assisted Home Health Aide. Our aides can handle various tasks including healthy meal preparation. DID YOU KNOW… about 21 million Americans or 9% of the population have been diagnosed with diabetes? 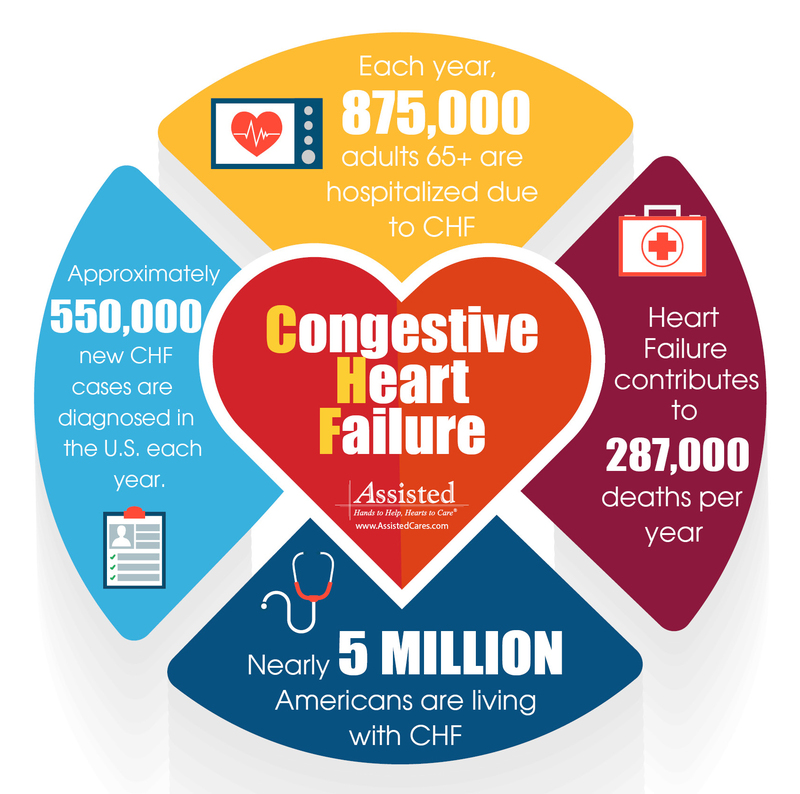 CHF symptoms like shortness of breath and fatigue can make what were once simple daily activities very difficult. With the help of Occupational Therapists from Assisted, CHF patients can learn ways to improve mobility and help restore maximum. Assisted Physical Therapists are also available to help patients with physician-approved activities and exercises which can help improve symptoms, reduce stress and increase energy levels. DID YOU KNOW… that lowering your blood pressure may reduce your risk of stroke and heart disease by about 50? Dorothy may have said it best, “There’s no place like home”. According to a recent study, nearly 90% of seniors fear moving from their home and losing their independence more than death itself. Seniors who receive care in the home live more comfortably with and experience expedited healing. It allows them to remain engaged with their daily activities and allow them to age in place with dignity.